A Monroe in Grand Theft Auto V.
The Pegassi Monroe is a classic sports car in Grand Theft Auto V and Grand Theft Auto Online. The Monroe is based on the Lamborghini Miura, with the front headlights of a Ford GT40 Mk.I or Ferrari F40 LM. The Monroe, being a classic sports car, has reasonably slow acceleration from 0 to 60 mph (97 km/h), doing that in 7 seconds. However, the Monroe has an enjoyable top speed of 165 mph (265 km/h). The Monroe's name is a reference to the late American actress Marilyn Monroe. The Monroe's default radio station is East Los FM. 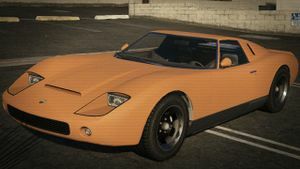 Miara, another Lamborghini Miura-based sports car in Grand Theft Auto 2. This page was last modified on 30 June 2015, at 20:50.